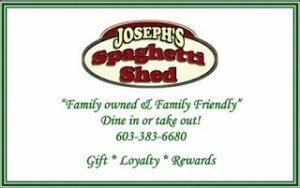 Joseph’s Spaghetti Shed is an independent, family owned restaurant located in Glen, NH…just north of North Conway. We have been serving up great Italian food and pizza for 28 years! Come visit and let us put a smile on your face! …just a few of the many wonderful comments Joseph’s Spaghetti Shed has received over the years! Back in the summer of ’84 my father, David, and I decided to open the restaurant and named it after my grandfather, Joseph. In a month we put together enough equipment to get started. Each day we went to the store to buy the following day’s supplies. We could seat 20 and had 19 plates!! Our first dinner menu offered only spaghetti but featured the homemade sauces my dad had created. We developed our meatball and lasagna recipes, and have since expanded to include pizza and many other Italian favorites…and some not-so-Italian favorites, as well!…and, of course, where would we be without our fantastic home baked bread?!! Well, here we are 30 years later! A lot has changed since the days of 19 plates! We have expanded our seating and menu a little more… My husband, Kevin, and I have 2 kids and there is a very good chance you will see them helping!…and, we have become almost as well known for our desserts as our sauces and bread! However, one thing that has not changed is our love for the food and the happiness we get from seeing others enjoy it! We are family owned and family friendly! !…located close to Storyland and Attitash in the heart of the Mt. Washington Valley! Visit josephsspaghettished.blogspot.com to see our menu and friend Joseph’s Spaghetti Shed on facebook to keep up with our upcoming changes and Dine to Donate events! We look forward to welcoming you!! Please note…up here in the mountains GPS doesn’t always work!! From the intersection of Rt. 16 and Rt. 302 in Glen (where the Dairy Queen is) go 1 1/2 miles west on Rt. 302 …We are on the left…..located conveniently between Attitash and Storyland! !